David Lane and Bujddy Finethy present Steve Charlton, Ace Allgood, Cotswold Collectible’s Greg Brown and yours truly discussing the future of GI Joe as a hobby, and where we go from here. You will hear about all sorts of exciting new products and techniques and how we think people will cope with a hobby that is being deliberately underserved by the company that created it. We go into depth about the future of the hobby as it pertains to customizers. 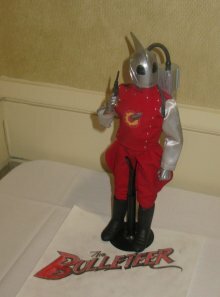 The image you see with this post is Jack Hall’s amazing mash-up of Bulletman and Dave Steven’s Rocketeer. This kind of imagination and craftsmanship is where the real heart of the hobby is found.